prepared by the Chef of their Restaurant “Il Cielo”. 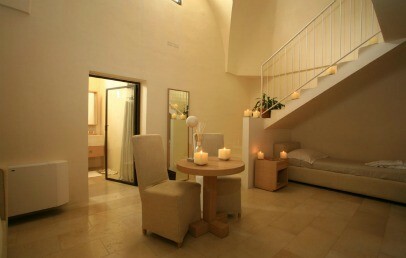 Suitable for those who want to enjoy the nightlife of Puglia, we recommend it especially to young and dynamic couples. The La Sommità Relais, occupies a historical building which dates back to the 16th century, in the beautiful historical centre of Ostuni, the renowned tourist centre in Apulia also known as the “White City”. The hotel is about 40 minutes far from the airport of Bari and 20 minutes from the airport of Brindisi. The distance from the sea is about 7 km. The 5-star hotel La Sommità is part of the prestigious brand Relais & Chateaux. 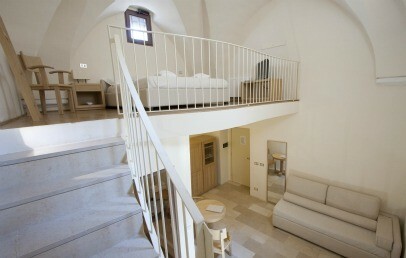 It has has 15 elegant suites, 4 of which have been recently built in an ancient Monastery next to the Relais. Each room has distinctive features. Interiors, are sober and elegant, with a mixture of minimalism and stylish luxury, in which cream and white nuances are the predominant colours. All Suites and Deluxe rooms at the Relais La Sommità are equipped with air conditioning, television with satellite channels with LCD screen, minibar, safe and a courtesy set in the bathroom at clients' disposal. Rooms are either Deluxe (La Corte, La Loggia, La Grotta, L'Affresco), Deluxe View (Il Mare, Il Sole, La Torre, La Palma, L'Aranceto), Suite (Il Colle, Il Cielo, L'Aurora, La Cattedrale, Il Camino) or the Master Suite Le Volte. Some of these have a balcony with sea view, whereas some others only have a sky-light. It is possible to add a third and a fourth bed in the Suites and Junior Suites. Rooms are equipped with spacious bathrooms where the stone walls and the vaulted ceilings recall the soft atmosphere of the underground thermal centres. The Wellness – SPA Centre offers relaxing massages, Turkish Bath and other body treatments. Together with the unique atmosphere of the Luxury Hotel in Apulia they contribute to the achievement of perfect psychological and physical wellness. 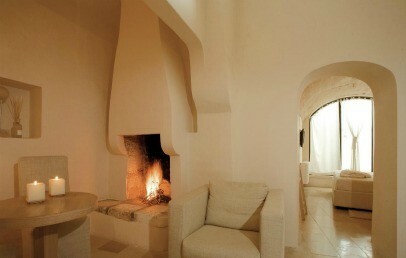 All the treatments offered by the wellness centre at the 5-star Sommità hotel use Spa Mareminerale methods and products. The Restaurant "Il Cielo" provides an outstanding menu, featuring the typical Apulian products and the exquisite flavour of the specialties in season. Dishes are accompanied by the best Italian wines and served within a frame of orange and olive trees in the old Spanish garden. Steps carved in stone lead you to the three antique cisterns, which were once used for storing oil but now are used as top-class wine cellars. With its antique drawings in the rooms and the large loggias, the La Sommità Relais is the perfect place for you to have breakfast and spend relaxing afternoons, while tasting delicious fresh- made cakes, chocolate, tea and herb teas. La Sommità offers in the vicinity a parking with special rate, a concierge service, a babysitting service upon request. Furthermore, the employees of the Relais are glad to assist to the organization of any leisure activities or excursions for their guests, such as: culinary and cultural tours, wine and oil tastings and much more. Tourist tax: The municipality of Ostuni requires the payment of € 2,00 per person/night (for the first 5 nights stay) to be paid on spot. Are exempted from the payment: children under 12 years, not self-sufficient disabled people and their assistants (a max. of 2 assistants), people who practice rehabilitation treatments in health facilities in the municipality and their assistants (a max. of 2 assistants). The exemption given by the last two cases is subject to the exhibition of proper health certification. Sober and elegant double room, characterised by modern design in which cream and white nuances are the predominant colours. The private bathroom is equipped with the typical stone shower, hairdryer, bathrobe and slippers. Sober and elegant double room, characterised by modern design in which cream and white nuances are the predominant colours. The private bathroom is equipped with the typical stone shower, hairdryer, bathrobe and slippers. The Deluxe View rooms offer a panoramic view from a big window or a small balcony. 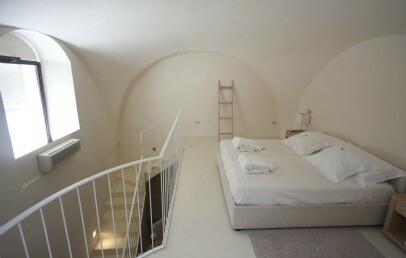 Exclusive Master Suite characterised by vaults in local white stones. 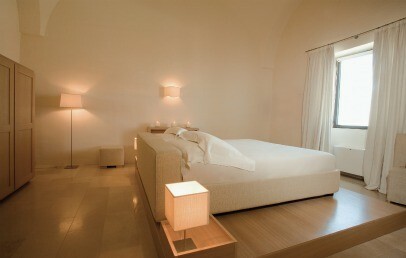 The room design is modern, in which cream and white nuances are the predominant colours. It consists of a fully equipped living room. The private bathroom houses a Jacuzzi for two and provides hairdryer, bathrobe, slippers and Bulgari beauty products. The Suite has some windows and opens onto a large terrace with panoramic view. Refined Suite characterised by modern design in which cream and white nuances are the predominant colours. It consists of a fully equipped living room. The private bathroom provides the typical stone shower (some suites have also a open space bathtub),hairdryer, bathrobe and slippers. Bulgari bathroom products are at Suite clients' disposal. Only for Charming's customers: free upgrade in the higher room category (upon availability) and homemade pastry!